Additionally, the Scivation XTEND GO Nucleus contains an effective combination of Caffeine, L-Theanine, and Sceletium tortuosum for productive intensity, pinpoint focus, and constructive energy. No agitation from a pre-workout, no energy-drink crash, no fats or sugars from an overloaded coffee, just a clean way to squeeze the most out of the task at hand. 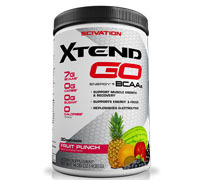 Use Scivation XTEND GO™ to squeeze the most out of your next workout and the most out of everything you do. Never stop. GO! Other Ingredients: Natural and Artificial Flavors, Citric Acid, Malic Acid, Sucralose, Acesulfame Potassium, FD&C Red #40 Lake, Gum Arabic, FD&C Blue #1 Lake. 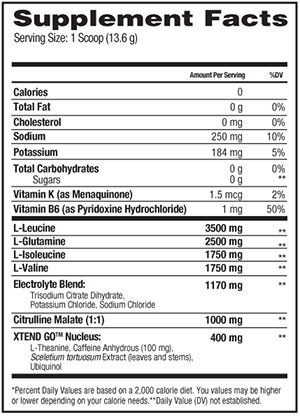 Directions: As a dietary supplement, mix one serving (one level scoop) per 8-10 ozs. of water. Stir or shake and consume during exercise on training days, or throughout the day on non-training days. Allergen Warning: Produced on equipment that also processes dairy, soybeans, eewheat, peanuts, eggs, fish, shellfish, almonds or other tree nuts, sulfites or corn.